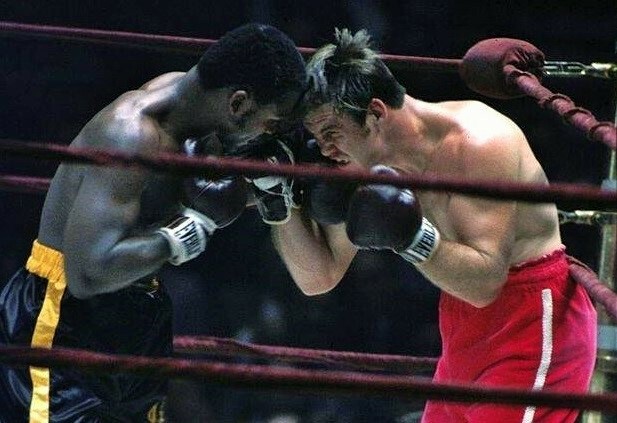 12: Joe Frazier RTD7 Jerry Quarry, June 23, 1969: An extraordinary three minutes of non-stop, toe-to-toe warfare marked the beginning of the 1969 Fight Of The Year between Quarry and “Smokin’ Joe” as the heavyweights, both packing deadly punching power, decided to test each other early. The entire round could have been contested in a broom closet, as both refused to willingly surrender a single inch of ring space, throwing and catching one huge shot after another, neither having a decided edge in an amazing three minute slugfest. Frazier and Quarry went toe-to-toe for virtually the entire three minutes. 11. Manny Pacquiao D12 Juan Manuel Marquez. 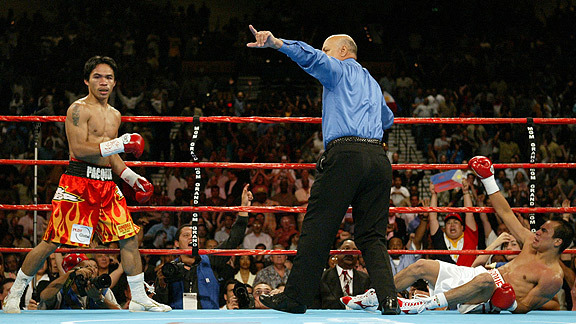 May 8, 2004: How appropriate that one of the great rivalries of recent boxing history began with a blistering and unforgettable three minute stanza. For much of it, Marquez was on the brink of disaster as he absorbed a series of power punches from the southpaw dynamo they called “The Pacman.” Three times the Filipino blasted the Mexican to the canvas with his cannon of a left hand, but three times “Dinamita” rose, as he just barely survived round one of the Pacquiao-Marquez tetralogy. In testament to Marquez’s skill and courage, he rebounded to win more than his share of the next eleven rounds and hold Pacquiao to a draw. Marquez hits the deck yet again. 10. 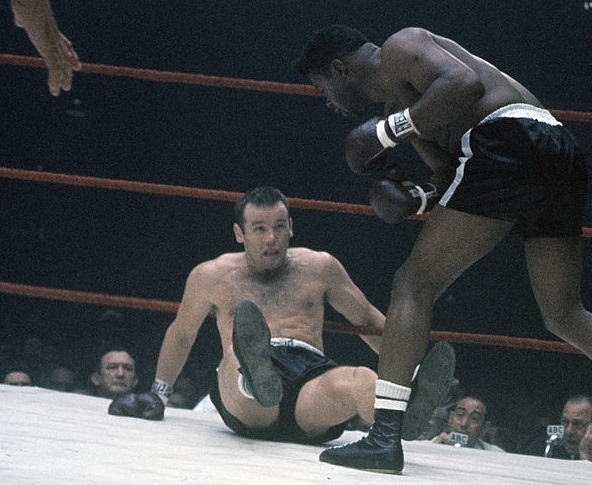 Floyd Patterson KO6 Ingemar Johansson. March 13, 1961: Patterson and Johansson were a match made in fight fan heaven as all three of their battles were defined by big punches and wild action. Round one of their final clash was especially eventful as it saw them exchanging power shots at a torrid pace and trading knockdowns. Twice Patterson hit the deck and for a moment it seemed certain that “Ingo” was about to end it early, but then Floyd crashed home a desperation left hook to put Johansson on his backside. The Swede rose and as the frantic crowd cheered them on, the two hurt warriors slugged away until the bell. Johansson and Patterson trade knockdowns. 9. Kelvin Seabrooks TKO10 Thierry Jacob. 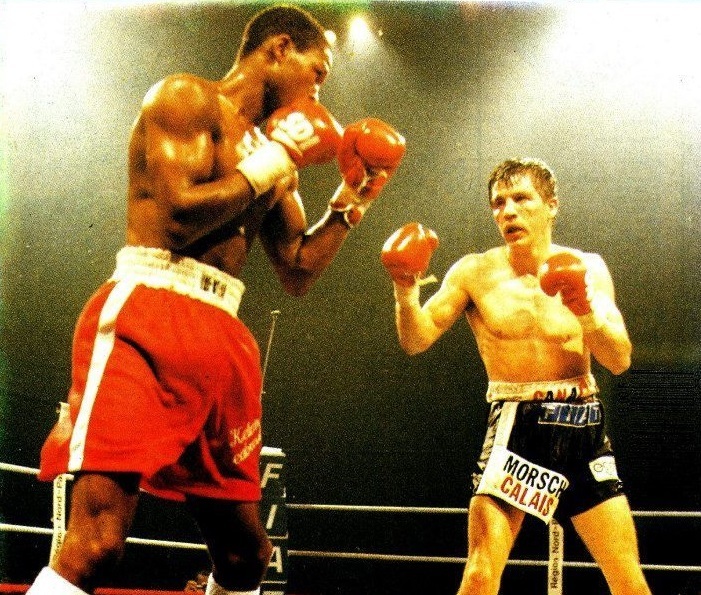 July 4, 1987: Just seconds into the match, defending bantamweight champion Seabrooks put Thierry down hard with a powerful right hand and the challenger’s hometown crowd went silent. But Thierry rose and what followed was intense, non-stop combat until suddenly it was the champion on the canvas, courtesy of the southpaw’s left fist. Seabrooks scrambled to his feet and Thierry pursued as the crowd roared and the champion soon found himself down a second time. The Frenchman pounded his wounded quarry all over the ring, but Seabrooks somehow survived the round, before going on to break the hearts of the challenger’s fans. Seabrooks and Jacob square off in Calais. 8. Nov. 5, 2011: James Kirkland TKO6 Alfredo Angulo. Everyone knew this pairing meant toe-to-toe action but no one could have anticipated the unbridled savagery of the first round. Throwing bombs from the bell, Kirkland drove Angulo back only to be struck with a vicious right hand that sent him to the floor. “The Mandingo Warrior” beat the count but Angulo was determined to end it and for a full minute he unleashed hell, a storm of non-stop power shots that had Kirkland reeling. It was a gamble for Angulo and one that did not pay off. “El Perro” had punched himself out and suddenly it was Kirkland in command and landing shot after shot, the attack culminating in the first knockdown of Angulo’s career just before the bell. Kirkland hits the deck to spark a wild slugfest. 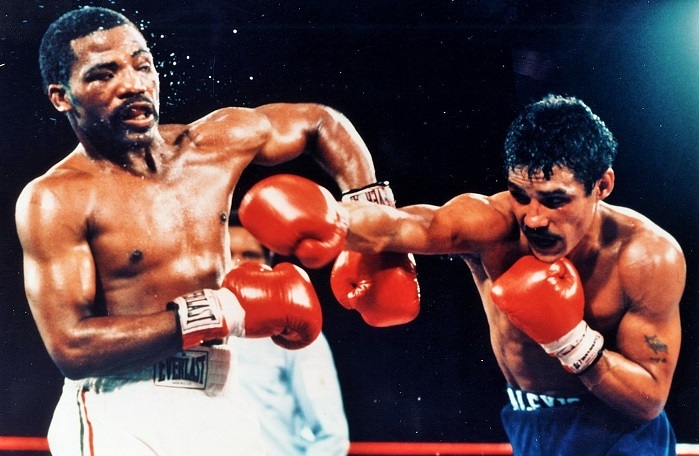 7: Sept. 9, 1983: Aaron Pryor KO10 Alexis Arguello. If only Arguello vs Pryor had been a trilogy, because there was something about these two champions that meshed so beautifully and the result was not just two unforgettable and action-packed battles, but also two ferocious opening rounds. And while both merit standing, it was decided we had to choose between the two for this list, so after careful consideration we judged round one of the rematch slightly more intense and engrossing, with the added excitement of an early knockdown. For rapid-fire, non-stop action between two all-time greats, it doesn’t get much better than this. Pryor and Arguello wasted no time giving fans a sequel worthy of the original. 6. 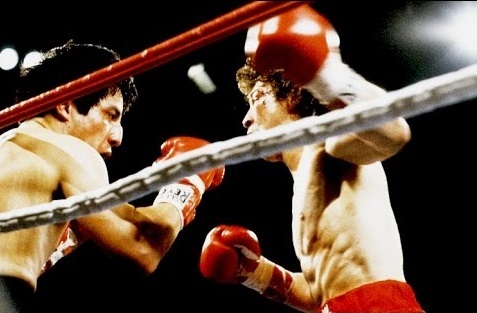 Ray Mancini TKO1 Arturo Frias. May 8, 1982: Rebounding from his defeat to Alexis Arguello, Mancini went hunting for Frias’ WBA title but the champion wasn’t about to surrender it without a fight. And in just under three minutes, Mancini and Frias gave fans as much, or more, action than most matches of ten times the duration. 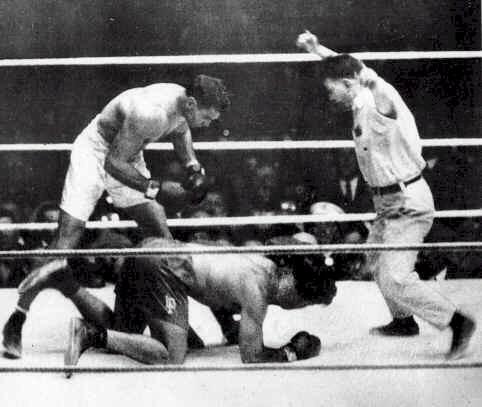 As one writer put it: “This was … a whirlwind battle, both men resembling thresher machines as they traded at a frantic pace.” Both were tagged with tremendous blows, and both were shaken, but it was Frias who hit the canvas and had to be saved by the referee with just six seconds left in the round. Frias and Mancini let the big shots fly. 5. Benny Leonard TKO6 Richie Mitchell II. 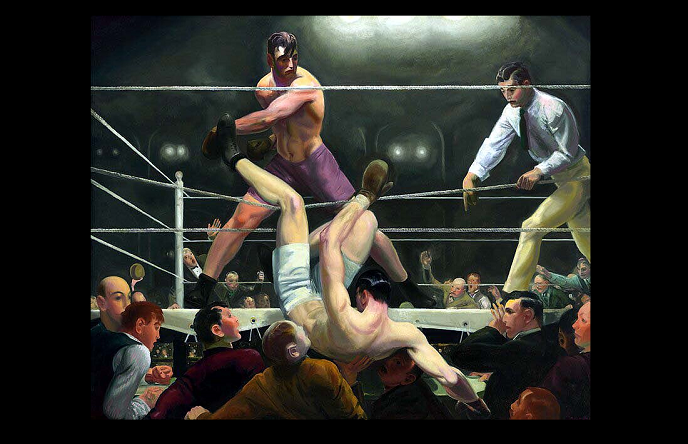 Jan. 14, 1921: A truly legendary opening round. Champion Leonard presided over perhaps the greatest lightweight division in history and one of the pugilists who made it so was Mitchell, a dangerous puncher. Benny had beaten him once before and figured he could so again, and quickly. He went for the knockout early and floored Mitchell three times, but then, to the shock of the Madison Square Garden crowd, the challenger rose from the third knockdown and promptly buried a left into Leonard’s belly followed by a right to the head. Mitchell and Leonard before their legendary battle. Down went the champion and so hurt was “The Ghetto Wizard” that he was supremely fortunate to beat the count. The biggest chance of Mitchell’s boxing life stood before him, a dazed and teetering Benny Leonard, but before he could strike, the champion snarled at him and waved him in. With the crowd roaring, Mitchell, fearing a trap, hesitated, and thus lost his chance to score what would have been one of the biggest first round knockouts in all of boxing history. 4. Archie Moore KO11 Yvon Durelle. Dec. 10, 1958: In an unexpectedly thrilling round in an unexpectedly thrilling fight, Durelle came close to scoring a monumental upset when barely a minute into the match he blasted Moore with a thunderous right hand and Archie hit the canvas so hard his head bounced twice. Somehow Moore beat the count but he was in desperate trouble and he soon found himself on the floor again. And then a third time. Moore rose but it was obvious to all he was dangerously close to being stopped and Durelle chased “The Old Mongoose” all about the ring and assaulted him with blow after blow. It appeared impossible that the former champion could survive, but somehow he did as the crowd collectively held its breath and as Archie staggered, skittered and backpedaled in the wake of Durelle’s attack. But, incredibly, before the round was over, there was Moore, standing his ground and exchanging heavy blows with his tormentor as the Montreal crowd went berserk. 3. Michael Moorer TKO5 Bert Cooper, May 15, 1992: Three solid minutes of heavyweight carnage. “Smokin’ Bert” wasted no time getting down to business as he ambushed Moorer at the outset, driving the former light heavyweight champ to the ropes and scoring a knockdown just 40 seconds into the match. But Moorer righted himself and it was toe-to-toe mayhem before the tables were turned and then –boom!- it was Cooper on the floor. Moorer’s follow-up assault was devastating but, incredibly, the round ended with Bert retaliating with heavy shots. Crazy, brutal stuff. And to think there were four more rounds to go! Without a doubt, one of the all-time great heavyweight slugfests. 2. Marvelous Marvin Hagler KO3 Thomas Hearns. April 15, 1985: If you have even just a passing familiarity with boxing, you knew as you read down this list that this now legendary three minute stanza of unbridled warfare had to be near the top. And you were correct. In the weeks leading up to their huge middleweight showdown, the mutual animosity between Hagler and Hearns only intensified and the pent-up hatred meant both were primed to unleash their big guns right from the opening bell. And that they did. Hagler threw 82 punches; Hearns threw 83. Almost all of them were fired with very bad intentions. What a war. What a round! 1. Jack Dempsey KO2 Luis Firpo, Sept. 14, 1923: It has been almost a century but we’re still waiting for an opening round that can top the mayhem and whirlwind excitement that was unleashed when the bell for round one rang at the Polo Grounds in New York City for the heavyweight championship battle between “The Manassa Mauler” and “The Wild Bull of the Pampas.” The sound of the bell was still echoing in the New York night when the two big heavyweights collided and the first clean punch, a right from Firpo, put Dempsey on one knee. The wild slugfest was on. Dempsey hovers as Firpo yet again struggles to rise. Good list. 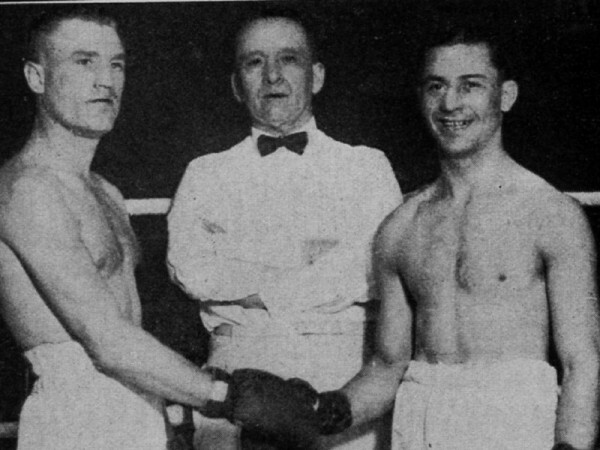 Maybe worth consideration: the fateful Benn vs Mccellan. Not only worthy of consideration, it was in fact on the list at one point, one of a few rounds that came very close to making the cut. Great round but a tad one-sided and, in stretches, a bit lacking in action. But perhaps the main negative factor was the interference from the referee at different points, which really undermined the excitement. In terms of a greatest, one-sided, opening round performance for a champion, Salvador Sanchez vs Wilfredo Gomez always come to mind. The fact that Sanchez dominated that entire round and had Gomez badly hurt, and the heart of Gomez to make it out the round on his feet. Brilliance of one champion and heart of another. 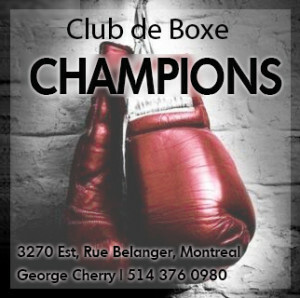 Montreal is The Fight City. Known in years past as "Sin City" and "Babylon on the St. Lawrence", it saw more than its share of ring legends over the decades. 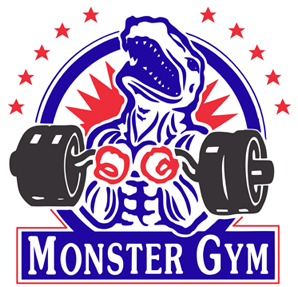 A metropolis where hundreds of young warriors train and battle each day in its many gyms, it is where Archie Moore, Sugar Ray Leonard, Roberto Duran and Bernard Hopkins all found greatness. It is a city of fights and fighters, of hockey and heroes, of broken dreams and immortal glory, a city unlike any other. 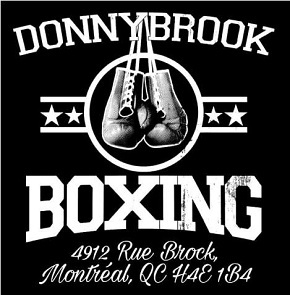 Montreal is The Fight City. © 2018 Media DEJ. All rights reserved.